Last week, the Associated Press released a story that sparked waves of outrage and confusion across the country as it made national headlines. 53,000 Georgian voters have been placed on a “pending” list due to some sort of discrepancy with their voter registration paperwork, meaning their eligibility has been called into question and is subject to further review. And that status disproportionately affects people of color. Kemp, the state’s elections czar, is of course also the Republican candidate for governor, facing off against former Democratic state Rep. Stacey Abrams, who, if elected, would be the nation’s first black female governor. Abrams claims Kemp’s office is leveraging relatively new elections code policies to suppress the minority vote. Kemp says that what’s happened is just the result of routine voter role maintenance. Regardless of how you frame it, it’s important that prospective voters don’t let this dilemma dissuade them from casting ballots on or before Election Day, November 6. Here’s a breakdown of what has happened and what you need to know. This drama all started with an Associated Press article. What did it say? Ben Nadler’s article, published on October 9, told the story of Georgian Marsha Appling-Nunez, who was trying to teach college kids how to ensure they’re properly registered to vote in the upcoming general election when she realized her own name came up online as ineligible. Confused, she poked around, only to learn that she’s one of more than 53,000 people whose registration status was set in limbo due to discrepancies with the paperwork they filed. 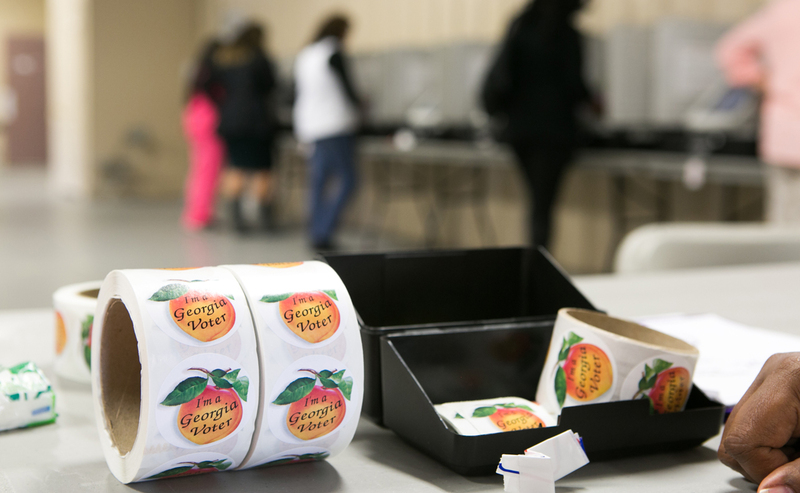 The Secretary of State’s Office was putting voters on hold because their registration information didn’t gel with Georgia’s “exact match” policies, passed in 2017, which requires registration paperwork to show information identical to what the state’s Department of Driver Services or its Social Security Administration offices have on file. That means a mild typo (a misspelling or a missing hyphen in a name, for example) could put voters in jeopardy, especially if potential voters don’t attempt to reconcile the issues. The kicker: Roughly 70 percent of the people sent to prospective voter purgatory are black, according the the records the Associated Press obtained. What does it mean if your voter registration is “pending”? If, for any reason, a potential voter’s registration info conflicts with the information on file at the DDS or Social Security office, their eligibility will be put on hold—and thusly given a “pending” status. Can you still vote if your registration is “pending”? Why are voter registrations “cancelled”? Voter registrations are cancelled if people remain on the “pending” rolls for 26 months without sorting out disparities with their DDS or Social Security office profiles. What is Stacey Abrams saying about this? Abrams chocks all this up to a campaign tactic by Kemp, who, she says, wants to curb the number of people of color showing up to the polls. She, as well as a handful of liberal advocacy groups, has also repeatedly called for Kemp to resign from his secretary of state post. What is Brian Kemp saying about this? Kemp says calls for him to hand in his letter of resignation are “ridiculous,” according to a report by the Forsyth County News. As for the accusations of voter suppression, Kemp claims that’s just a ploy by his opponent and other Democrats who want to defame him. “If you are in ‘pending’ status, you can vote in the November 6 election,” Kemp wrote in a tweet. What are people doing in response to all of this? A federal lawsuit lodged by a collective of civil rights groups, including the NAACP of Georgia, asks a judge to disregard the state’s “exact match” statute. The lawsuit alleges the state’s law disproportionately afflicts voter of color. Additionally, Abrams camp has whipped together an “expansive and aggressive voter protection team” to ensure there’s no foul play at the ballot boxes, as well as working to process the 53,000-plus pending voters.
.@staceyabrams: "Let me be clear: We will work to process the 53,000 voter registrations, but we will not wait for justice." Head on down to the secretary of state’s My Voter Page and dial in your personal info. The site will show you if you’re all set and where you’ll need to go to cast a ballot.